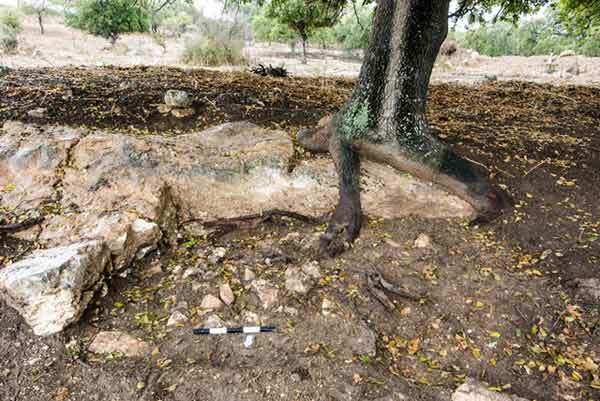 In 2013–2014, trial and salvage excavations were conducted along the northern fringes of Horbat Sasay, south of Kiryat Ata (Permit Nos. A-6922, A-7144; map ref. 212430-721/742403-569). The excavation, undertaken on behalf of the Israel Antiquities Authority and financed by the Cross Israel Highway Company Ltd., were directed by A. Nagorsky, with the assistance of A. Chocron and M. Hater (area supervision), E. Bachar and Y. Amrani (administration), M. Kahan, R. Mishayev and R. Liran (surveying and drafting) and A. Perez (photography). Trial trenches were excavated at the site by A. Oshri prior to the archaeological excavation. Two areas were opened in the east and west of the site (Fig. 1), where ancient remains were discovered in the trial trenches conducted prior to the excavation and were discerned on the surface. The eastern area extended across level ground on an agricultural terrace and in which three secondary areas (B1–B3) were opened. Quarries (Stratum I) and architectural remains (Stratum II) dating to the Hellenistic period (third–second centuries BCE), remains of a building and a pottery workshop from the Late Roman period (third–fourth centuries CE; Stratum III) and agricultural terraces constructed in the fourth–fifth centuries CE (Stratum IV) were discovered there. The western area, which extended across a rocky slope, yielded a stone quarry (L19), field walls (W29, W73, W82) and a cave (L21). Stratum I. 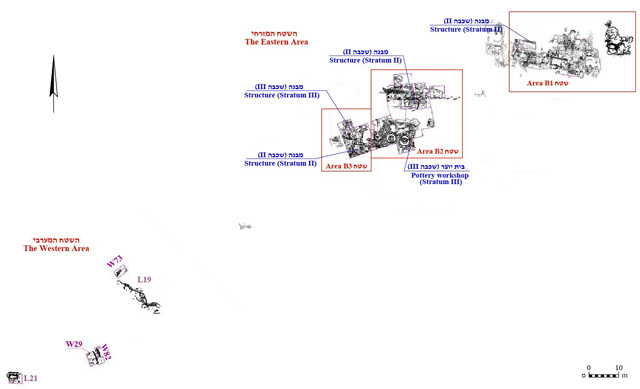 Remains of many quarries, their size according to the stones produced, are ascribed to the earliest stratum (Fig. 2). Evidence of quarrying marks for stones and severance channels (average width 5 cm) at a variety of depths were observed, with chisel marks preserved on their bottom. The earliest pottery finds from the excavation date to the Hellenistic period, thereby dating the quarries to this time. Stratum II. During this phase, the surface was leveled, the deep quarries were filled with medium-sized and large fieldstones and deep natural pits were blocked with a thick fill of small fieldstones and quarrying debris (max. thickness 1.3 m). Three buildings were erected on the leveled area, 30–40 m apart. One of the structures, in Area B1, was completely excavated, while the other two, in Areas B2 and B3, were only partially excavated. The soil fills above and beneath the floors yielded pottery sherds dating to the late third and second centuries BCE, as well as about 30 stamped amphora handles, a decorated stone bowl, coins, a large number of millstones of various types, ceramic lamps, iron objects, glassware and animal bones. Stratum III comprised remains of a dwelling and a pottery workshop that were partly revealed. The dwelling consisted of at least two rooms adjacent to a courtyard. The northern part of the pottery workshop that was revealed included exterior walls and three kilns. All that survived of the kilns were the fireboxes and ceramic debris, which included jars, saqiye jugs and cooking pots with wide openings, dating to the third–fourth centuries CE. Stratum IV. During this last phase, agricultural terraces were constructed above the buildings. Several pottery sherds dating to the fourth–fifth centuries CE were discovered in the soil fill that abutted the terrace retaining walls. Quarry 19 (c. 10 sq m) was exposed at the foot of the slope. The stone quarrying included eleven hewn corners and severance channels (width c. 5 cm) of various depths. A scant number of abraded pottery sherds and glass fragments were found in an accumulation of soil in the quarry. Field Walls 29, 73, 82. Only four large stones (0.60 × 0.60 × 0.65 m; Fig. 3) were preserved of Wall 73. Soil mixed with small stones and a few worn pottery sherds abutted both sides of the wall. Only short sections of Walls 29 and 82, built directly on the bedrock, were preserved. The two walls were parallel and situated c. 1 m apart. Wall 29 (length 3.3 m, width 0.3 m) consisted of a single row of small fieldstones and W82 (length 3 m, width 0.55 m) was built of two rows of large fieldstones laid on their narrow side with a fill of small fieldstones. 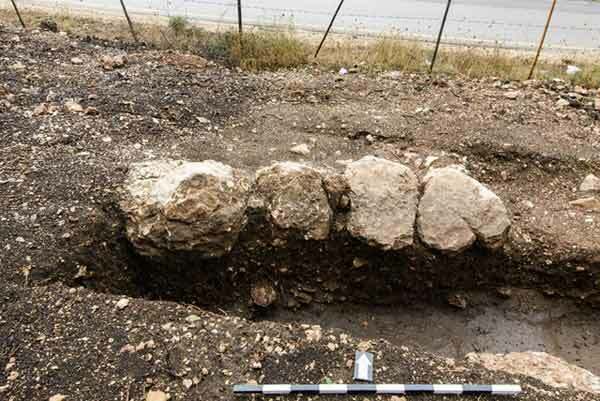 Both walls were abutted by soil containing several abraded sherds dating to the third–fourth centuries CE. Cave 21. A wide opening of a cave (1.1 × 2.8 m; Fig. 4) was discerned on the surface prior to the excavation. 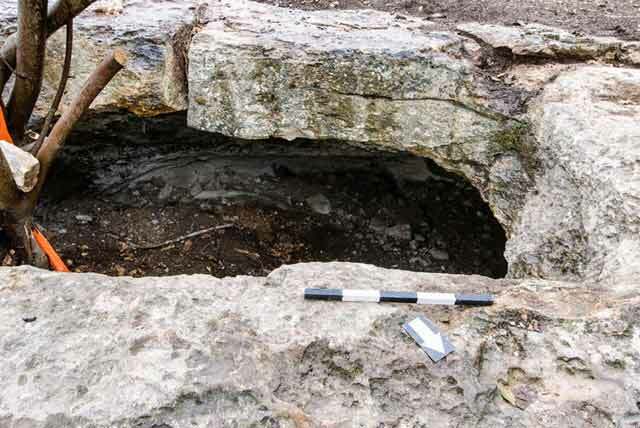 It was enclosed by a rock-cut rectangular frame with rounded corners (1.5 × 3.0 m, depth of rock-cutting 0.25 m). The outline of the cave was irregular (4.0 × 4.5 m). The cave was filled with medium-sized and large fieldstones (height 0.5 m), probably a result of clearing stones in the area nearby. Under the stone fill was an accumulation of black soil and small stones (thickness 0.8 m) that contained several small worn pottery sherds and animal bones. The excavation was halted due to safety concerns. 2. Small quarry, looking east. 3. Field Wall 73, looking north. 4. Cave 21, looking southwest.